You must enter a quantity of at least 3 EverPup jars to your cart and enter the corresponding code from below at checkout. Limit: one per customer. See Amazon.com for full details. What’s So Special About Everpup? 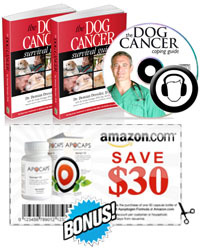 The Everpup mix of vitamins and minerals was created just for dogs who aren’t fighting cancer, to help keep them healthy. If you’d like to try it, remember EverPup is backed by a Money Back Guarantee. Everpup Ultimate Daily Dog Supplement is one of the best ways to ensure that your dog receives exceptional nutrients for healthy, long life. We tried Everpup on Tripawds Spokesdog Wyatt Ray and give it “Three Paws Up!.” To read more about its health benefits, visit the EverPup website. Check it out, and return here to try Everpup Ultimate Daily Dog Supplement and save! Remember, we are not veterinarians. The information presented here is not meant to be construed as medical advice or guidance, nor should it be substituted for professional veterinary assistance. Always discuss any remedies and treatments you wish to pursue with your veterinarian. Tripawds is a user-supported community; all purchases made here help us continue providing resources and support to our Tripawd families. Thanks for shopping at Tripawds!